It’s 7:30 a.m. I’m slouched over a grocery cart in a customer service line, trying to read my online Bible. My comprehension is under siege by store announcements, customer chatter and a ridiculously loud floor cleaning machine rolling by. I can barely read, let alone ponder, look up companion verses, take notes and all my other quiet time stuff. The rest of my morning is filled with errands that must be run before a mid-morning prayer group I lead. Ironically, my personal intercession will be a series of short conversations in my car. I can’t access my prayer guides or close my eyes for listening prayers. I won’t make any entries in the “answer” column of my prayer journal. In short, my God time today will not look like anything featured in all those how-to devotional books. It won’t even look like my typical quiet times. Thank God, he’s set me free from a legalistic, perfectionistic view about devotions, cause the only reason I’m messed up today is on me. I mismanaged my early morning. That’s it. I no longer work full time, no longer a senior pastor’s wife with a chaotic schedule, nor are there any young children living here. Today, I simply took baby steps away from my routine, fussing with laundry, housework, a writing assignment and e-mails, while saying, “I’ve got to get to my quiet time.” It’s usually top of the agenda. While the dog and I walk at zero dark thirty, I praise, worship and intercede. When we return home, I finish intercession and move to the Word. After putzing this morning, I belatedly checked my time. I raced through a shower, dressing, and eating, then, hustled out the door. In younger years, when valid circumstances shanghaied my devotional time, I went without. If I couldn’t do it “right,” I didn’t do it. As a bonus, I’d feel crummy about it all day. There are seasons of life, sisters. 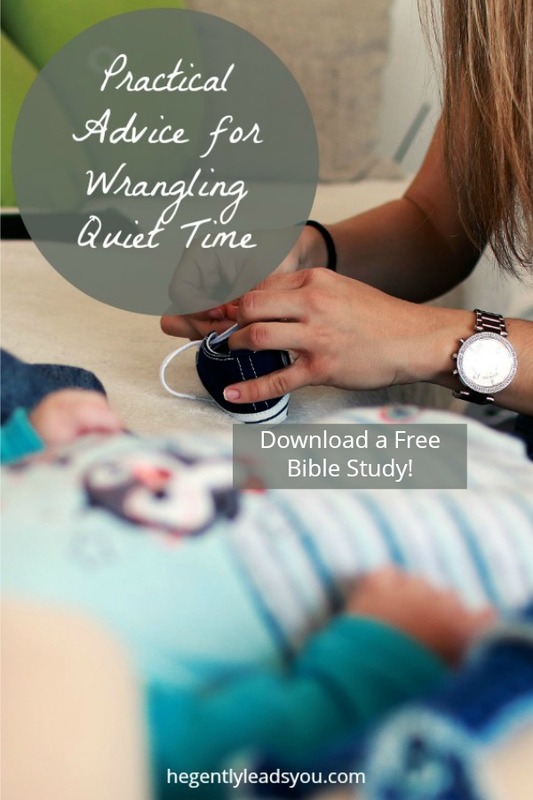 If your home houses young children, then unfinished laundry, sticky walls, bathroom mishaps, endless mini-dramas over toy use, food choices and bedtimes, sickness, and a host of other events will be hurled towards your quiet time and Bible study plans on most days. If you confine your communion with God to rigid boundaries, you set yourself up for disappointment. Don’t get me wrong. We need to do the work of setting aside time for God and His Word, but how do we set achievable goals? Unrealistic expectations are soul-crushing. Are you at the other end of the spectrum, making no plans? Are you using this season of life to grant yourself a furlough from Bible study? Young mothers play that card sometimes. “I don’t have time for that right now. I’ll start when the kids are in school.” For real? Would we do that with any other relationship that matters to us? Whether you’re lost in a puddle of unfulfilled goals or drifting along with none, the facts are the same for all believers; God desires alone time with you because He loves you. He wants to talk with you, empower you and teach you about Himself. So, if you’ve made goals, ask God for the how-to in keeping them. More on that in a minute. Those with no goals, ask God for the want-to. Improvise- Ask The original, creative problem solver to point out times to be with Him. In the early mornings, maybe all you can manage is, “I love you God, let’s do this!” Don’t compare yourself to others and don’t turn how-to books into must-do standards. Adapt- With young children, new adventures arise daily. What worked yesterday might not work today because sleep schedules change, kiddos get sick, growth spurts create weird behavior and on and on. Sure, go ahead and set a time and place, but don’t chuck it all to the wind if that doesn’t work on a particular day. Ask the master planner to provide you with time and energy somewhere else in the day. Overcome- Sometimes you need to take a deep breath and press on into the moment. Take your dirty diaper smelling, stomach growling, eyes drooping self and read, pray and listen for a few moments before the demands reach tidal wave proportions again. I read my Scripture passage in a grocery store this morning because God nudged me to do it. He knew my brain would be too tired later in the day to concentrate on Romans. The funny thing is, I actually understood the passage after the fourth read through, in spite of the distractions. (The customer service line moved slowly!) My car prayers covered a lot of territory plus God created a space for me to just listen while I waited for a train. God’s heart yearns for us. The particulars of how you spend time with Him matter, but more importantly, He just wants us to show up and be present every day.